For reasons of coldness and cheapness, I found myself in Primark in Brighton on Saturday, buying a pair of gloves with the structural integrity of a tramp's underwear. Still, they only cost a quid and now the cold snap seems to have ended, so I am currently smug. Smug AND full of knowledge, as a trip to Primark can teach you a lot about fashion, particularly things which could well have been in fashion within the last decade or so. One item I saw, however, transcends the fleeting fads and trends of clothing fashions. It is simultaneously fashionable and not, having always been and never having been at the same time. It is the wolf shirt. The wolf shirt gained some internet notoriety following a slew of joke favourable reviews on sites like Amazon and Wolfmaxx. These meme had it that the wolf shirt made the wearer sexually desirable to the point that you might well have to start carrying a stick with you at all times. However, in spite of that - or maybe, in the meta-meta-meta-übercool 21st Century, because of it - wearing a wolf shirt remains a potent statement and a powerful look. Who's to say that the wearers are not, in fact, up to their gills in fuzz? When considering jumping someone who is wearing a wolf shirt, I think one must first consider whether or not the wearer is doing so as a conscious gesture of wry self-aware appreciation or just out of a strongly held conviction that the wolf shirt makes them a love man. The former is just as likely to be a dreary hipster twit who works in the games industry and thinks that Margaret Thatcher ruined their life (although they were born in 1991) as the latter is likely to be a musky, wolf-obsessed weirdo with an old Norton motorbike on his living room table. For the wolf shirt is, after all, just an item of clothing. The wearer will prove to be as unique a person as any - all with their own foibles, talents, hopes and dreams. The danger of making the (admittedly tempting) decision to hit on anyone wearing a wolf shirt should be clear for any rational person to see. Never judge a book by its wolf cover - even if it is a book about wolves - and never judge a person by their wolf shirt. Even if that wolf shirt is a mint green fleece worn by a female pensioner in Hove. Be careful what you wish for, because that wish could just come true. And turn up at your wedding on a Harley Davidson wearing a wolf shirt. 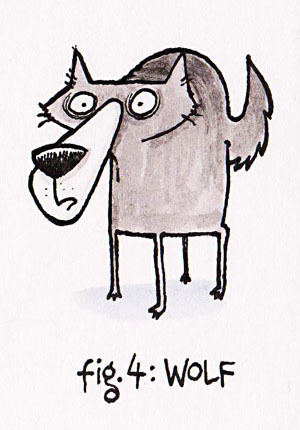 I am commenting only to add my own self-drawn Wolf Icon to the debate. I've got a wolf shirt, and I'm a girl. I think this is breaking ALL KINDS of rules.